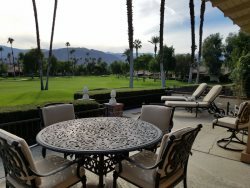 Lake Mirage is superbly located, only 3 1/2 miles from shopping on upscale El Paseo and 2 miles to The River. Westfield Mall, which is anchored by Macy's, is about 3 miles from Lake Mirage. The Albertson shopping center and Bristol Farms are within easy walking distance.